The majority of time many of us use our car for short journeys only. Due to this, we tend to somewhat neglect our vehicles only to become concerned when an impending long drive is required. Taking a long drive increases stress on many components of your vehicle and if you’re not used to taking long journeys, it’s important that you ensure your car is up to the job before leaving. Detailed is a checklist of the things you’ll need to check before a long drive. The checklist does not include items that will typically need to be checked by a mechanic, such as brakes, suspension or electrical and mechanical components. Let’s start with under the bonnet. Engine oil is the lifeblood of the the engine. Engine oil needs changing relatively frequently as it becomes less efficient over time and mileage, meaning it will not lubricate engine components as well. If you are unsure when your oil was last changed and it was some time ago, it may prove beneficial before a long drive to book your vehicle in for a basic service which includes an oil change. If your oil doesn’t need changing, you’ll simply need to check that it has sufficient oil. To do this, your vehicle should ideally be parked on a reasonable level surface. Locate the dipstick. Dipsticks are made conspicuous, usually with a brightly coloured handle. Oil levels should read halfway or more between the marker gauge. Remove the dipstick and wipe the oil from the end with a tissue or cloth. Firmly replace the dipstick and once again remove (this is to ensure you get an accurate reading). You will have some form of marker gauge at the end of the dipstick. The oil levels should be roughly around the middle or higher towards the end of the marker for maximum oil level. Anything under half-way, remove the oil cap and top up. Oil cap is located on top of the engine. 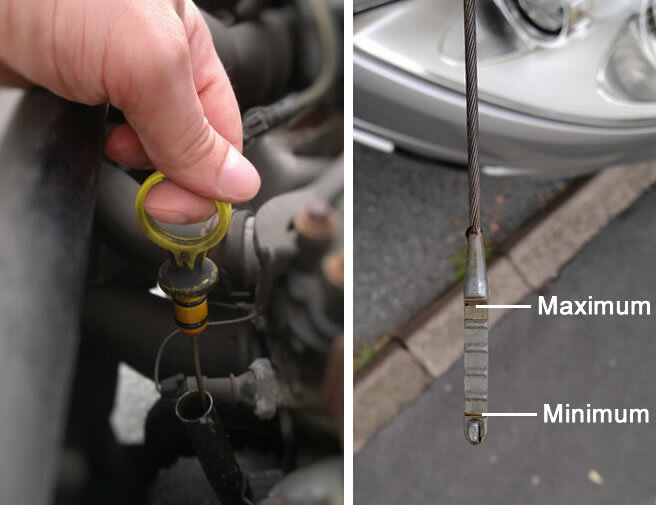 It’s important that you top up slowly and in small increments and to frequently check the dipstick for levels. Over-filling can damage the engine. Engine coolant is essentially a combination of antifreeze and water. Antifreeze does of course help to prevent the coolant from freezing during subzero temperatures, but the chemicals in antifreeze (ethylene glycol) actually increase the boiling point of water which also helps to prevent engines from overheating. Before taking a long drive, ensure that you have sufficient coolant levels in the overflow tank. Coolant circulates the engine to help it keep help it maintain operable temperatures. The coolant is cooled via a radiator and airflow. This is essentially a sealed unit and therefore shouldn’t require topping up very often. You can purchase coolant that is correctly mixed with antifreeze and distilled water that you pour directly into the overflow tank. If your tank requires topping up regularly, it may suggest you have a leak. Have this looked at before taking a long drive. If you run the engine without enough coolant, you risk overheating the engine and possibly causing irreparable damage. 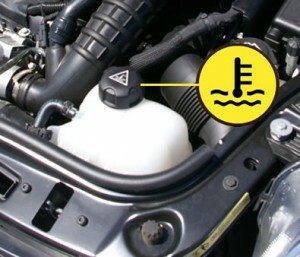 To check the coolant levels, locate the coolant tank. They often have a brightly coloured top and will often have a thermometer symbol on the top. You will have a minimum and maximum marker level of the tank. Ensure it is filled to the maximum level. Don’t worry if you over-fill as the excess will simply be expelled from the tank overflow. If you are unsure where the tank is or where to fill it to, consult the manufactures handbook or consult a dealership. Do not undo the coolant lid when the engine is hot. Hot water may erupt from the tank. Allow the engine to cool first. Windscreen washer fluid is often neglected and only noticed when you really need it. The last thing you want is to be traveling on a road you don’t know with smears on the windscreen making it difficult to see. You can use tap water if need be, though mixing with washing up liquid may not do your paintwork too much good. It’s best to purchase pre-mixed windscreen solutions from an auto store. They contain cleaning agents that help to remove smears and insects along with antifreeze to prevent the liquid freezing in cold conditions. The washer reservoir is often easily located with a brightly coloured lid and will typically have easily identifiable symbol on the lid. You can typically fill it up to the top as this will do no harm. Similarly to the engine coolant system, the brake system should be a sealed unit. Spongy brake pedal or frequent top-ups of brake fluid may indicate a leak in the system, or degraded fluid in the system that requires draining and replacing. 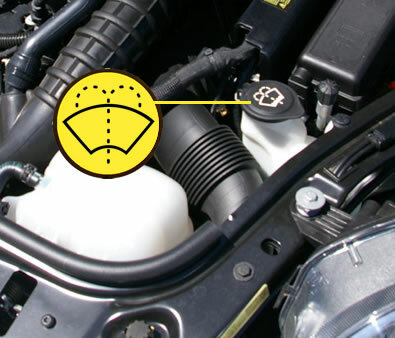 The reservoir under the bonnet will likely have the ‘brake’ symbol on the cap and possible a ‘DOT’ rating for the fluid that must be used. 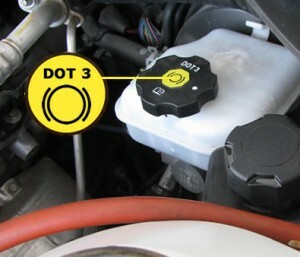 Many vehicles use DOT (Department of Transport) 3 fluid, whilst others may use DOT 4. There are DOT 5 and 5.1 variants. Brakes get extremely hot when applied due to friction, heat is transferred even to the fluid itself. Fundamentally the higher DOT number, the higher the boiling point of the brake fluid. Use the DOT rating that your vehicle handbook informs you of or what is detailed on the reservoir cap. On the reservoir tank there should be a minimum and maximum marker level. Ensure levels are not below the minimum and top up if necessary. Clean cap and any potential debris that may fall into the tank before opening and use new unopened fresh fluid only. If your car is quite new, then this shouldn’t be an issue. A car battery lasts from around four years onward. There’s not really a specific time when they need replacing as it’s dependent on various factors such as quality of the battery, driving habits – frequent short drives can lessen a batteries life and colder climates may shorten a battery lifespan. 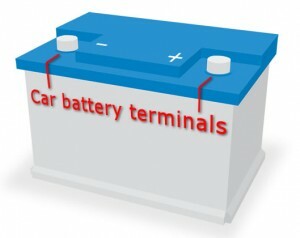 Further information can be seen: car battery lifespan and maintenance. Take a quick look at the battery under your bonnet. Look at the general condition of the terminals. If there are signs of corrosion, it may be nearing the end of its life. Another sign is if your car appears to be turning over slower when starting. The last thing you need when out on a long drive is a dead battery, so it may be best to get it replaced. Check all tyres to ensure your vehicle remains legal and stable whilst driving. Legally all tyres must have at least 1.6mm of tread around the entire circumference of the tyre and along 3/4 of the centre width of the tyre. To help you establish this, manufacturers will often incorporate tread depth bars between the groves of the tyres, around 1.6mm in depth. If your tyres are becoming flush with these markers, you need to have them replaced as anything lower will not only be illegal, but will reduce the amount of grip in wet conditions. 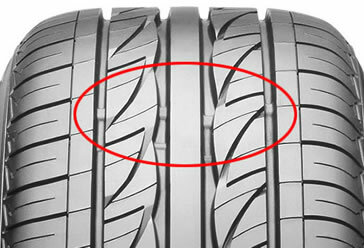 Before taking a long drive in particular, check also the pressures of your tyres. Vehicles with unevenly inflated, under or over inflated tyres can become unstable. Most cars have a sticker on the inside of the drivers door detailing the correct pressure based on the vehicle and load. This will be related to the size of the tyre which you can compare from the sticker to the details on the sidewall of the tyre. Check also around for cuts or budges in all tyres as this may potentially lead to a blowout. Don’t forget the spare tyre if you have one (otherwise check your inflation kit). Though this doesn’t need to comply with the legality of the tyres in-use, it makes sense to ensure your spare is in good condition and at the correct pressure. It is a legal requirement to having working external lighting on your vehicle, so have an all-round check to see if they’re all working. Activate the hazards for an easier method of checking indicators. It may prove beneficial to take along spare bulbs before taking a long road trip. Along with windscreen washer fluid, you’ll need an efficient set of wipers to clean the windshield. If they are looking worn or torn or do not clean the windshield very well, have them replaced. You’ll likely only need the rubber blade part replaced which only costs a few pounds. Paper map – most of us have been there….your Sat Nav gets lost or gets you lost. You can’t go far wrong with a traditional paper map in these situations. Water and food – not only for yourself, but taking along extra water can be used if you need to top up windscreen washer or coolant fluids.